So I'm still on the 'diet' and it's still going well, just we all need a treat now and again, right?? 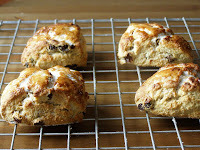 I absolutely LOVE my regular scone recipe, we have them breakfast probably once a week. However I wanted to try replacing the vegetable fat (shortening) that I use in them with healthier extra virgin coconut oil. When cold it's a solid fat like shortening so should give the same lightness in the scones, but of course, would make the scones taste 'coconutty'. I just decided to embrace that and replaced the rice milk with organic coconut milk and through in some chocolate chips for that 'bounty bar like experience'. Altogether so happy with these, I cannot convey to you how amazing the kitchen smelled while these were cooking! Now, you may notice these don't have any actual coconut in them. That was quite deliberate on my part as I didn't want that texture in these - just a softly infused natural coconut flavour, the type you don't get from extract. However if you like, some dessicated coconut could certainly be added, about 1/3 cup or 30g would suffice at a guess. 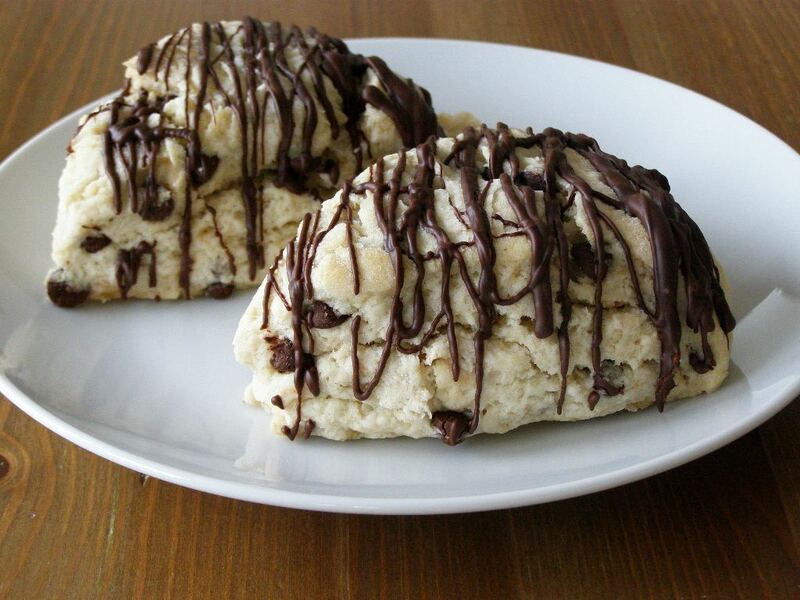 Coconut Chocolate Chip Scones: makes 6 large triangles but I've also gotten 14 mini round scones here. Preheat the oven to 190C/380F. In a large bowl mix together the flour, cornstarch, sugar, baking powder and salt. Cut in the coconut oil using a pastry cutter or by food processor until it is crumbly *see note above on this; stir in the chocolate chips. Mix together the coconut milk and vanilla then stir this into the flour. Mix quickly until it just comes together. Bring together into a ball and place on a floured surface. Shape into a large flat disc, about 1 1/2 " thick. Cut in half, then cut each half into thirds. It's most important you don't handle these very much - don't knead it or your scones will be heavy and tough. Place each triangle onto a baking sheet lined with baking paper and bake for about 20 minutes. You will have to toothpick test these as they don't go very golden, all that white coconut oil and milk I presume. Let cool on a wire rack. When hand cool simply melt your dark chocolate in the microwave, or in a bowl over simmering water, until melted. Use a teaspoon and drizzle back and forth over the scones. You could also just dip the entire tops in chocolate, the amount of chips in these is not excessive so they can take it! Thanks so much Lisa!! I'll pop over and try that - what a great idea :-) Hope I can do all the linky stuff - despite being a blogger, I'm not the most computer literate - haha! These scones look wonderfully fluffy. I'm a big fan of coconut oil myself and use the organic refined kind for when I don't want it to impart a coconut flavor. 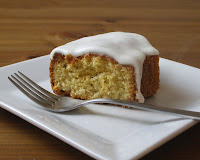 I just made a batch of these and the scones turned out wonderfully fragrant with a nice even texture. I substituted dried cranberries and forewent the chocolate all together, and they were still very tasty. One thing I noted, though, was that in your recipe above, you don't actually mention when to add the solid-state coconut oil, but I easily figured that out by looking at other scone recipes (post flour mixing, but before adding chocolate / dried fruit etc.). Thanks!